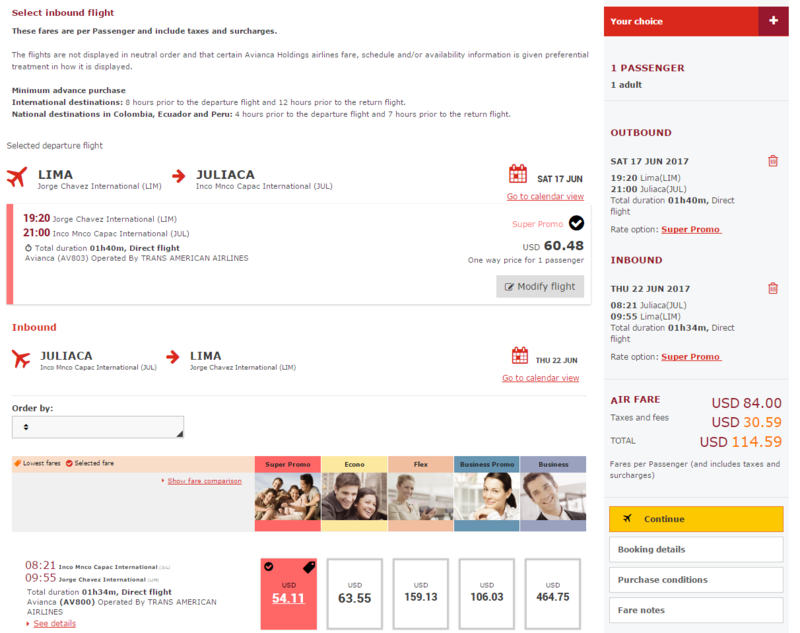 Does Avianca actually check your residency status if you fly on a residents-only fare in Peru? TICKETS MAY ONLY BE SOLD IN PERU. RESIDENCE IN PERU SHALL BE ACCREDITED WITH PERUVIAN ID OR ALIEN CARD OTHERWISE AN ADDITIONAL CHARGE OF USD 178.5 WILL BE APPLIED OR BOARDING WILL BE DENIED. Some other places where people are querying or complaining about this discrimination in fare prices include this Trip Advisor discussion and this Flyer Talk dicussion. What would happen if I lived in a state of blissful ignorance - are they actually enforcing this fee? Currently the difference in price is in the region of $178.5, so a 10% chance of slipping through makes it worthwhile (low risk, high reward). Therefore it is also helpful to know, is the penalty per booking or per leg? 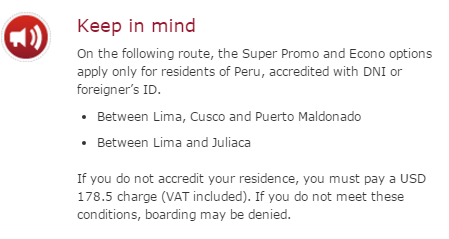 I'm a dual Peruvian-American citizen having taken my American friends to Peru I can attest that, while controversial, that the cheaper fares are meant to encourage Peruvian citizens who may not otherwise be able to afford air travel on their modest incomes. This is along the lines of Florida resident discounts at Disney World etc. So to answer your question, the fine is per leg of the flight. You may be denied boarding of the flight all together. I know this is an old question but this can serve as future reference for anyone having this dilemma in the future. Lastly, yes they check your residency status. If you hand them a US passport, they will automatically scrutinize you because the main proof of residence is the DNI (Documeno Nacional de Identificacion). If you don't have that, or the foreign residence card, you will be assumed to not be a citizen of Peru. Of course, your ticketing agent may ignore it but you're essentially handing the information at check-in to get caught. Should you do an online check-in, then it is probably possible. FYI, for fares booked after February 4, 2018, the residency restriction is no longer in place for booking discounted domestic airfares in Peru. Not the answer you're looking for? Browse other questions tagged air-travel fees-and-charges residency peru avianca or ask your own question. Can you share frequent flyer status with people in your travel group? What to do if you need to fly in the Schengen area and lose your ID card? What does the flight jargon “fare class” actually mean? Is it the same as either “fare basis (code)” or “travel class”? How early can you check your bags with Frontier for US-Domestic flights? Can you travel within Portugal if your residency card is expired? Are airlines required to take you to your stopover location or only to your final destination? If your flight is inside the USA, will you be asked about your immigration status?